Answering a problem that perhaps doesn't exist, the QX1 allows you to use your phone with interchangeable lenses and a DSLR sized sensor. 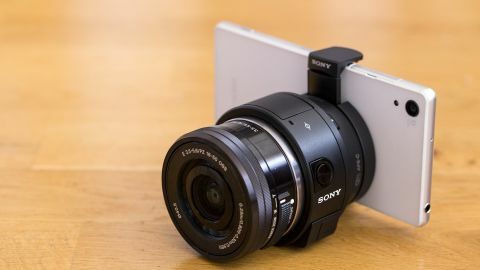 Sony's QX100 and QX10 digital cameras introduced a new and reasonably unusual concept into the market. They look like lenses that you would fit onto a camera body, but they actually have a sensor built in. They're designed to attach to your smartphone and communicate with it wirelessly, meaning that the phone acts as the camera's screen to compose your image. It seems like a strange concept, but apparently they proved popular enough for Sony to take it one-step further and produce the QX1. Here we have an APS-C sized sensor and an E-mount so that you can change the lenses on the unit. That sensor is a 20.1 million pixel back-illuminated CMOS device, the same kind as found in Sony's range of compact system cameras. There's also a Bionz X processor - the company's most advanced and also found in top-of-the-line cameras such as the A7R. To communicate with your phone there's built-in Wi-Fi and an NFC chip. Images may be transferred to the phone or stored on a Micro SD card installed in the QX1. Unlike previous cameras in the QX range, the camera can now shoot in raw format. This means that photographers retain greater control over images in post-production than before. Using a battery from the E-mount system, Sony claims that the QX1 is capable of shooting around 440 shots from a single charge. As you're relying on your phone to control the camera, it's worth noting that your phone's battery life is also something to take into consideration. You can focus and shoot with the QX1 independently of a phone, but you won't be able to see what you're photographing. Controlling the camera is achieved via the Sony PlayMemories app - a free download for both iOS and Android. There's a couple of other third-party apps which allow you to use the camera with them, but with most of the popular ones, such as Instagram, you can't. The PlayMemories app brings a number of different shooting modes, but crucially full manual control isn't available. Aperture priority and shutter priority are though, if you want to take the majority of control yourself. ISO sensitivity ranges from ISO 100 - 16,000. You can set this yourself in semi-automatic modes, if you like. Shutter speeds of 1/4000ths of a second to 30 seconds are available - there is no bulb mode if you want anything longer than 30 seconds though. A number of different white balance settings are available. Video recording is also available at full 1080p and 30fps. A built-in stereo microphone captures sound. A built-in flash is included, with a guide number of four - there's no way to add additional accessories, such as an external flash or viewfinder. Continuous shooting of up to 3.5fps (for up to 15 shots) is possible. The camera comes supplied as standard with the 16-50mm f/3.5-5.6 power zoom lens that you'll also find with most of Sony's range of compact system cameras. There's also a wide range of different optics available both from Sony itself and third party manufacturers. A-mount lenses could also be attached via a mount adaptor, too. Clear Image Zoom is also available, a type of digital zoom that means you can boost the length of any lens attached by 2x - so the 16-50mm gives you 100mm at the telephoto end of the lens. In order to attach it to your phone, there's a detachable and flexible mount on the back of the camera. It can fit a variety of different phone sizes, but it wouldn't be big enough to attach to a tablet. There's also a tripod thread on the bottom of the camera.